End of September 1935, Director Louis Leplee of the Gerny’s cabaret in the Champs-Élysées met Edith Piaf singing beetween Avenue Mac-Mahon and rue Troyon in the Pigalle area. On 2 October 1935, he hired him for a week and gave him his stage name la Môme Piaf (the Brat Sparrow). Piaf, the sparrow so frail in relation to her physical that contrasted so much with the power of her voice. Her success was such that he prolonged her contract until April 6, 1936, the day of his assassination. A thug of Pigalle, knew of Edith Piaf, shot him in the head. She underwent 48 hours in custody but no charges were retained against her for this drama which almost put an end to her career. On October 2, 1935 is set to 10° 22′ of Gemini. It has a Powerful force conjunct with the Moon in House VII. The degree of the year is set to 0° 01′ of Virgo. It has a Very Powerful Force conjunct with Midheaven, Mars and Venus transit. At nineteen years and nine months, he announces the Mercury-Moon period. The Moon has a Very Powerful force in House VII in a nocturnal birth. The planetary period and the degree of the day are under the influence of the Moon. Of Beneficial quality and a Very Powerful force in House VII, that of contracts, Moon has an analogy with her first engagement in a prestigious location that marks the real beginning of his career. The degree of the year has a Very Powerful force because it is situated at the Midheaven. Mars is the governor of the Part of Fortune and located at the Midheaven, it becomes determining of that luck for her career. On October 2, 1935 is at 10° of Gemini, in natal House VII and House XI of SR. 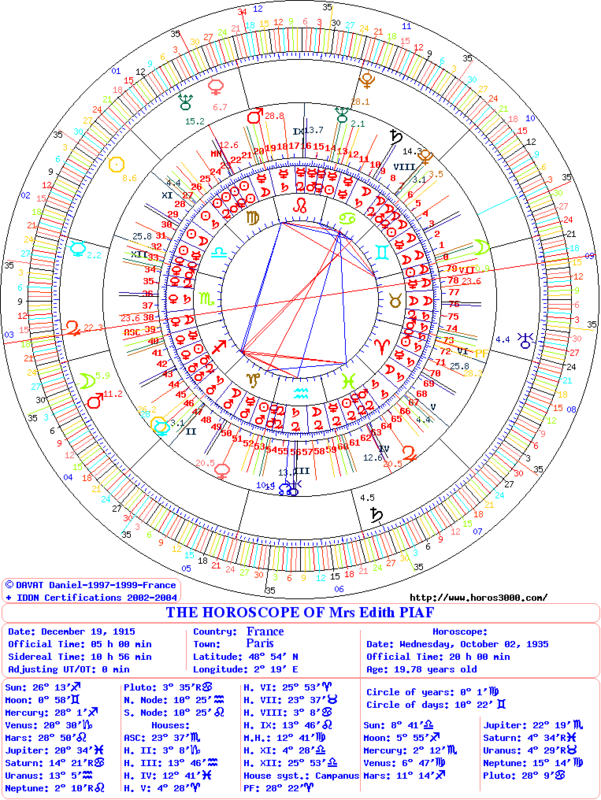 The degree of the year is at 26° 28′ of Leo conjunct with Mars, natal Midheaven and Ascendant of SR. The degree of the day is at 10° of Gemini, in natal House VII and conjunct with both Moons. Both Moons are of Beneficial qualities and of Very Very Powerful force in natal House VII, that of the contractual commitments and in House XI of SR, that of supports. 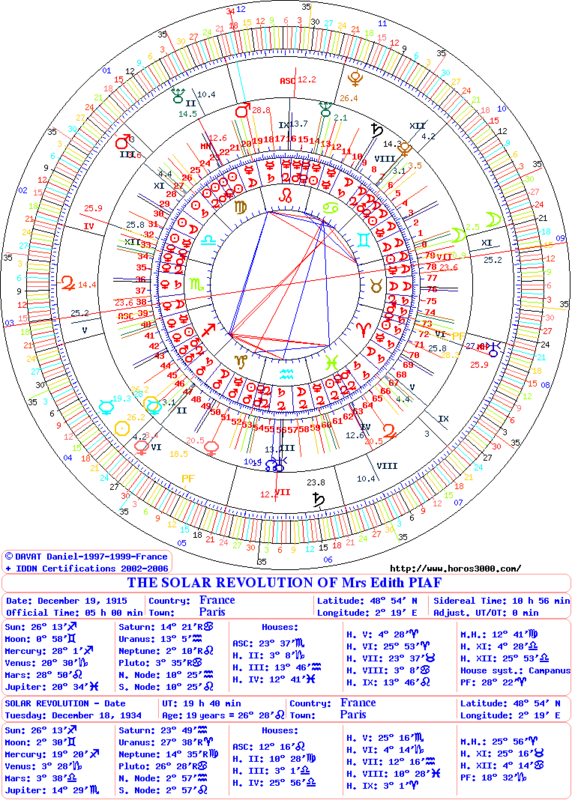 The degree of the year is conjunct with natal Mars which is conjunct with natal Midheaven and also governor of the natal Part of Fortune and the Midheaven of SR in Aries. These three astral energies, that connect both Midheavens with the Part of Fortune, give luck for the career. This entry was posted on Friday, April 11th, 2014 at 3:55 pmand is filed under Edith Piaf. Both comments and pings are currently closed. using? I’m having some small security problems with my latest Ƅlߋg and I’d like to find something more securе. Dо you have any solutions?